If the 121 were to be eliminated, it would only add a three minute walk to people's commutes. It runs three very small blocks away from the 120, only a tenth of a mile. Really useful. But, I like to be objective until the end of the post, so I will try to restrain myself. 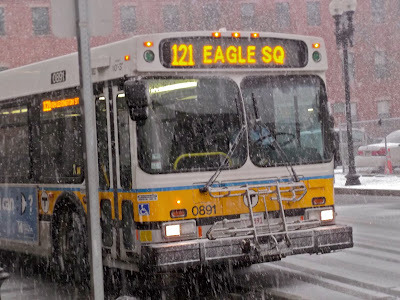 I had been wanting to take the 121 for a while, because it looked so useless on the MBTA bus map (whoops, so much for being objective). I had the chance one snowy day, so I headed out to Maverick to take a ride. Checking the schedule at the station, it was due to leave at 3:20 to "Eagle Square," whatever that was. In the morning, it runs to Wood Island Station, but in the afternoon it gets cut three tenths of a mile back to Eagle Square. For some reason. I was planning to walk from Eagle Square to Wood Island Station, if the bus ever came. Most of the passengers waiting inside the lobby of Maverick (it was way too cold and snowy to wait outside) headed for the 116, 117, or 120, all major buses. I felt a bit left out, to be perfectly honest. At 3:25 or so, the 121 came, and an MBTA employee stepped out saying "Thanks for the ride" to the driver. The bus then looped around the station entrance and came to a stop a little further down Maverick Square. I got on, along with maybe 10 other people. We headed down Meridian Street, and went over the portal to the now-closed Callahan Tunnel. We also passed some snowy parks, and a lot of different businesses. We soon turned onto Lexington Street, however, leaving behind the hustle and bustle of Meridian Street for a more quiet residential neighborhood and a small school. Bennington Street, where the 120 runs, was easily visible to the right. We soon started climbing a hill. On occasion, there would be a car going the other way which, due to the narrowness of Lexington Street, would have to duck into a parking space as the bus swerved around. We started going downhill at a fairly steep angle, and dropped off the five people or so who were still on at Eagle Street. Now I was the only one on the bus as it began to get very industrial, i.e. wasteland with barbed wire fence. At Chelsea Street, we looped around a small parking lot and headed back. Large, ominous vats could be seen, holding who knows what? I was expecting to be kicked off, but the driver just went back up Eagle Street. On the way back, we picked up six people, all of whom got off at Maverick. As the bus looped back around to do its 8 minute journey again, I headed into Maverick station to get back on the Blue Line. Ah, but this picture is beautiful! Ridership: On the way there, about 11 or so people rode. Five got off on Meridian Street, so only 7 people used the solo portion on Lexington Street. On the way back, 6 people rode as I said, but three got on along Meridian Street. They all seemed to be residents, just using the 121 to get to the subway. Pros: Um...hmm...you got me on this one. Cons: First of all, this bus feels so unnecessary to me. It runs a tenth of a mile from the 120! What's the point of this one existing?! And the MBTA seems to realize it's unnecessary, because the schedule is abysmal. Every half hour, rush hour only! And it only runs that often because the route's so short. And for some reason, it only runs all the way to Wood Island in the morning. Why shorten it to Eagle Square in the afternoon? It's a useless connection between Maverick and Wood Island, sure, but you might pick up some extra riders by going all the way. That's why they do it in the morning, right? They could definitely eliminate this bus - a three minute walk never hurts anyone. Nearby and Noteworthy: There were a lot of interesting businesses along Meridian Street. I always like seeing unique, small businesses, and I don't recall seeing any major chain stores along the route. I didn't get to visit any of the businesses personally, but they looked pretty nice from the outside. The only thing keeping this from a 1 is that people apparently use it. But I don't think they would be very inconvenienced if they eliminated this route - none of the people riding were seniors or anything. And I guess the ride on narrow Lexington Street was kind of cool, but not enough to warrant a higher score. At any point besides rush hour, people have to use the 120, anyway. Why not make it full-time? Yeah, not much has happened in a day. Sorry.